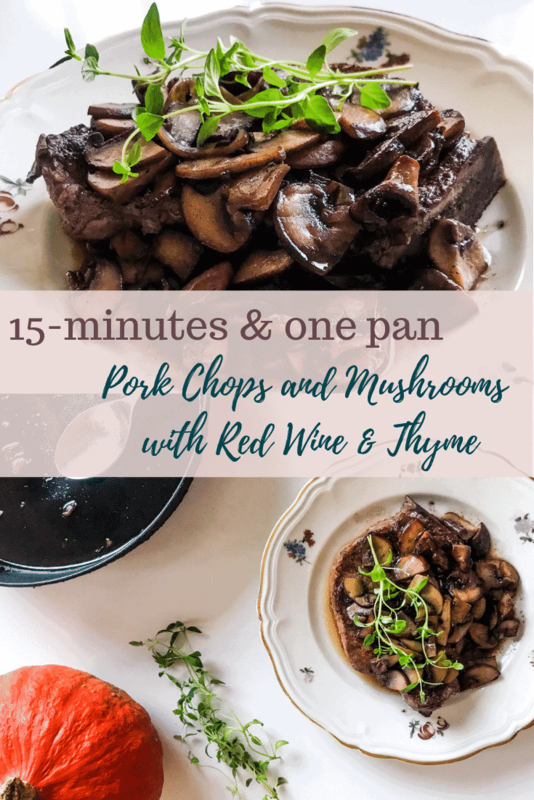 Quick one-pan Pork Chops and Mushrooms with Red Wine and Thyme is a great dish for when you’re craving something delicious and flavorful but haven’t got a lot of time to spend. TTFB (Time To First Bite, of course) is just 15 minutes, but the taste of the red wine & thyme reduction hints of much more time spent in the kitchen. If red meat is not your thing but you still crave something similarly quick & fally – head on over to my Creamy Red Wine Chicken Pasta instead. Vegetarian option? Just leave out the chicken for that one, just as tasty. Fall is my favorite time of the year, without a doubt. For one, it feels like a new start, so much more so than New Years to me. Anything is possible. “Maybe this is the year when…” and so on. Second, it’s getting a bit colder and staying in is so much more of an accepted option – music to the ears of that inner introvert of mine. 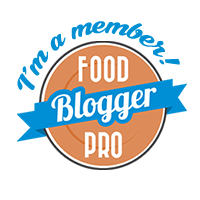 Third – and yes, most important – it’s the time of year best suited to all my favorite flavors. 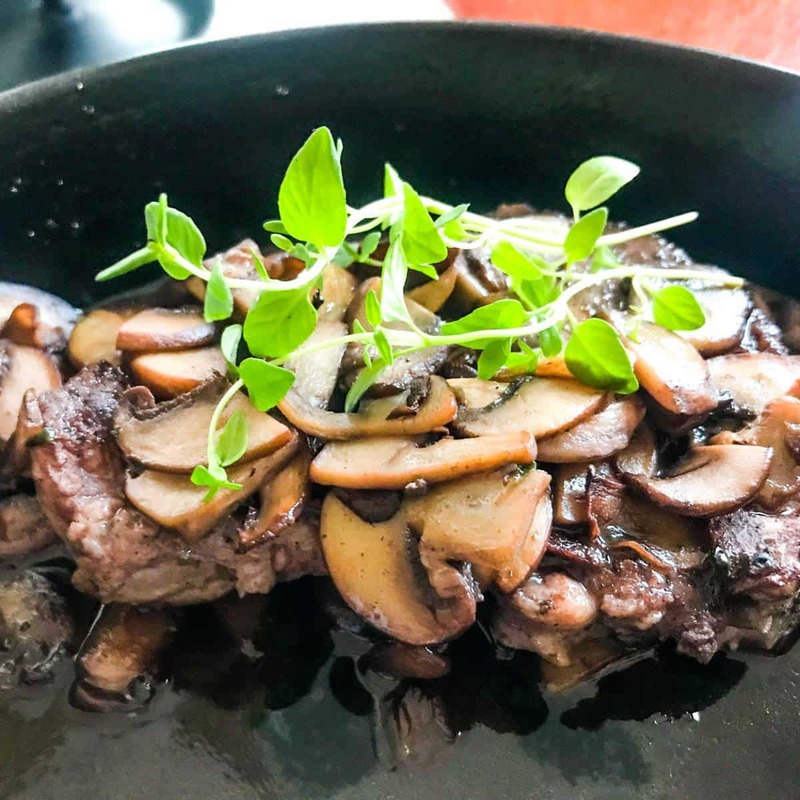 Heavy, full tastes such as mushrooms, red wine, thyme and really anything umami never taste as good as in the fall, now do they? However, these are also flavors that often demand time to reach their full potential. And I guess I’m not alone in not always having three hours to spend on dinner, right? That’s exactly why this recipe for Pork Chops and Mushrooms with Red Wine and Thyme is a quick one (oh, and all made in just one pan – we all love to spend less time on dishes as well, right?). I promise, it tastes like you spent far more time cooking than the quick 15 minutes (tops!) you actually spent on this dish. 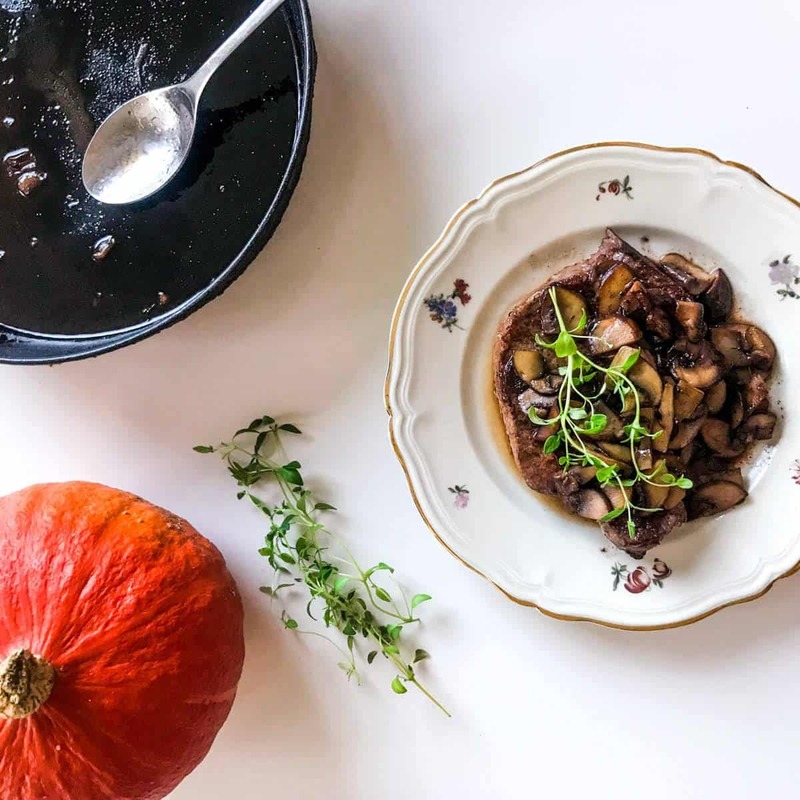 Fall flavors love other fall flavors – so if you have the time, I do suggest pairing your pork chops and mushrooms with something nice and starchy, like mashed potatoes. And maybe a nice heavy red wine while you’re at it. I’d probably do a Barolo or other Nebbiolo wine, but then again – when wouldn’t I? 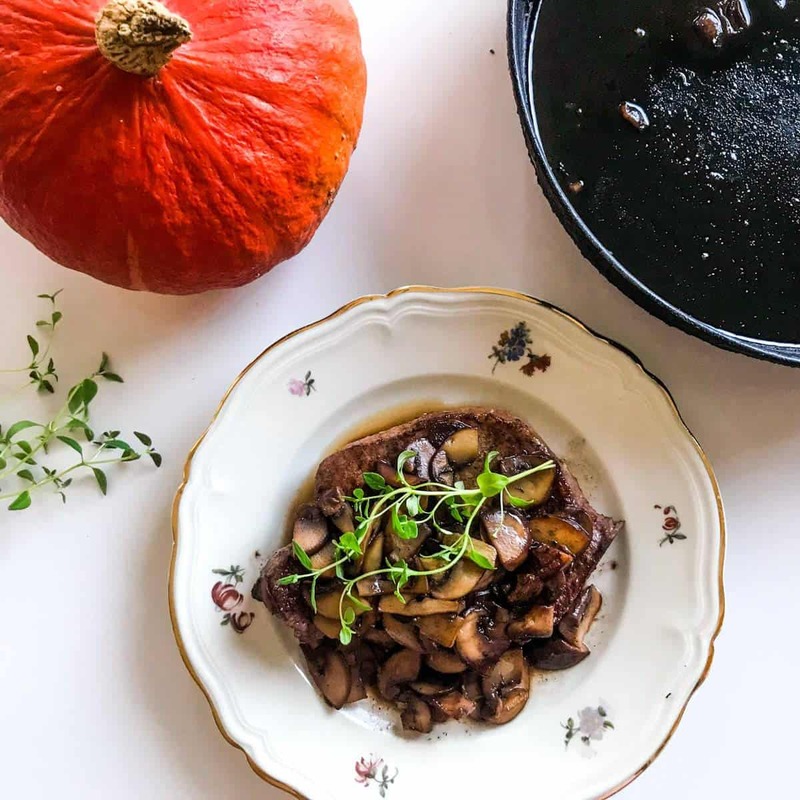 So if this weekend you find yourself craving something deliciously full of fall flavors, but have better things to do than hang around in the kitchen (like, I don’t know, maybe go for a nice crisp walk in the pretty fall colors? Or just, life? ), then do give this recipe a try. It’s a good one! If you do try it – please tag me @alwaysusebutter if you post it anywhere, I love to see your versions! 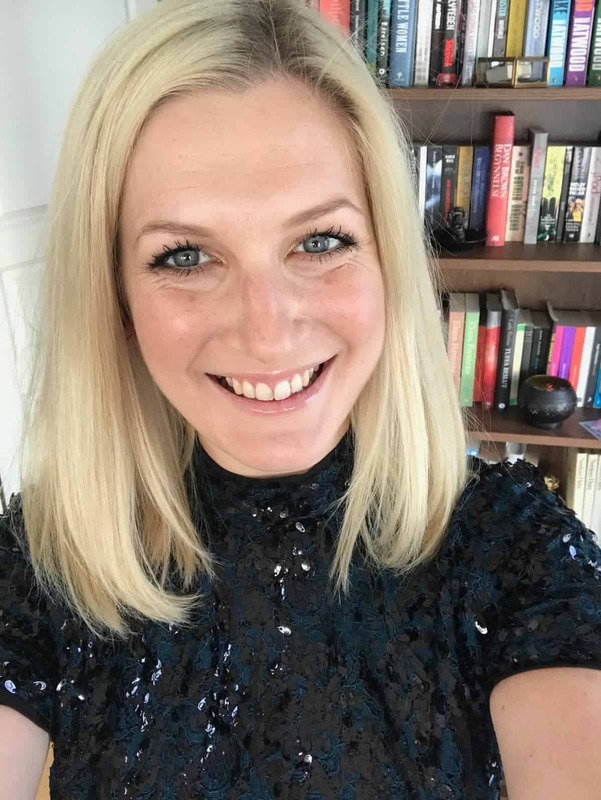 I’d also love for you to let me know what you think – the easiest way is by leaving me a comment and/or a rating below. Rub the halved garlic clove over the pork chops to give them some flavor, then season the pork chops with salt and pepper. Heat a pan over medium-high heat and add 1 Tbsp of butter. Add in the crushed garlic cloves and thyme sprigs. Cook until fragrant, 1-2 minutes. Add in the sliced mushrooms and cook until nicely colored. Add in more butter as needed, you don't want the pan to go dry. 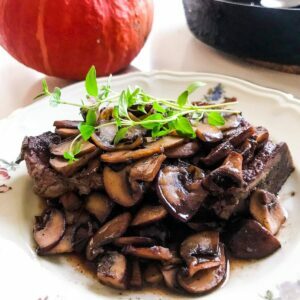 When mushrooms look nice and brown (after about 3-5 minutes), remove the garlic cloves and scrape the mushrooms and thyme to one side of the pan. If possible, position the pan so that this part is not directly over the heat. Add the pork chops to the pan and cook for 2 minutes per side until they have a nice color. They do not have to be completely finished inside at this point. Make sure to stir the mushrooms once in a while so they don’t burn. When pork chops are cooked on both sides, add the red wine and water to the pan, place it back fully on the heat and lower the heat a bit. Let the pork chops cook in this for one minute on each side. Mix in the mushrooms and thyme with the liquids and coat the pork chops with this as they are cooking. Remove from the heat and remove the thyme sprigs. Let the pork rest for a few minutes. Serve the pork chops with the mushrooms on top, and maybe a sprig or two of fresh thyme just for prettiness. Add mashed potatoes or other sides as desired, and top everything with a generous dose of the red wine reduction from the pan. Loved this! It took me a little longer than 15 min. because I forgot to take the chops out to warm up to room temp. And I was reading the instructions! But it came out great. Tasted yummy and it made the whole house smell wonderful! It’s a keeper! So happy you liked it, Marianne! Easy mistake to make 😉 Hope it didn’t take you too much time though!